SOLAR SAILING: When NASA's MESSENGER spacecraft skimmed past Mercury on Oct. 6th, it did so with record-setting precision. "Our goal was to fly 200 kilometers from the planet’s surface, and we missed that target by only 0.6 kilometers," says mission designer Jim McAdams of Johns Hopkins University. This was made possible by a form of solar sailing: controllers rotated the spacecraft and tilted its solar panels to catch the very small pressure of sunlight and fine-tune the spacecraft’s trajectory. Congratulations to the MESSENGER nav-team! NASA's STEREO-A spacecraft recorded this spectacular prominence on Sept. 29th. No sunspot was involved. A magnetic filament snaking around the sun's north pole suddenly became unstable and erupted, disgorging a cloud of hydrogen large enough to swallow a hundred Earths. How and why prominences erupt is a topic of ongoing research. The blasts are unpredictable, which is why today's sun is so full of promise: image. 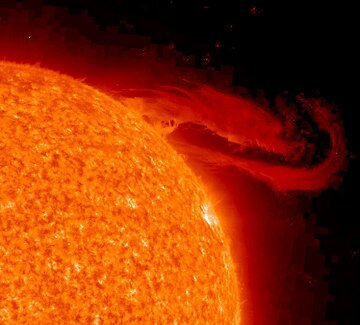 By the standard of prominences, solar activity is looking up. This high-resolution snapshot, taken as MESSENGER was flying away from the planet, shows the "tangerine stripes" converging on their source. It is a young, unnamed crater about 68 miles in diameter. Radars on Earth had seen this crater before, but never in much detail. MESSENGER's close-up photography has revealed its fruity nature for the first time. No one knows what made the crater (a comet? an asteroid?) or why the debris flew so far from the impact site. Answers may emerge as mission scientists analyze additional photos and sensor readings MESSENGER is beaming back now. 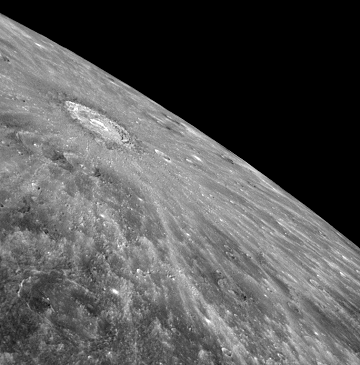 Meanwhile, it's a Mercury mystery; browse the flyby gallery for more. On October 9, 2008 there were 990 potentially hazardous asteroids.